Pressed into action for a Work of Heart! Letting go of a loved-one’s personal possessions is never easy and sometimes it can be quite a tall-order. My late-wife Jane was a very keen weaver and a notorious hoarder of wools! Recently, the sight of all of these amazing varieties of wools now just lying idle, spurred me on to finding a deserving home for them – all 12 baskets full! It was a chance viewing of a local television news article back in January, which delivered the perfect solution to my quest. Clare Young, who like myself had been recently widowed from her long-time partner, was on her own quest to raise £50,000 for the hospice that cared for her late-husband Ken. Clare’s project, aptly named the Work of Heart Garden, was a project in which Clare and her army of knitters would create a large (four metres square to be exact) knitted garden, whilst appealing to the public to create and donate knitted hearts to be sold for the Sue Ryder Leckhampton Court Hospice who provided expert palliative care for Ken, and support for Clare at a very difficult time for them both. 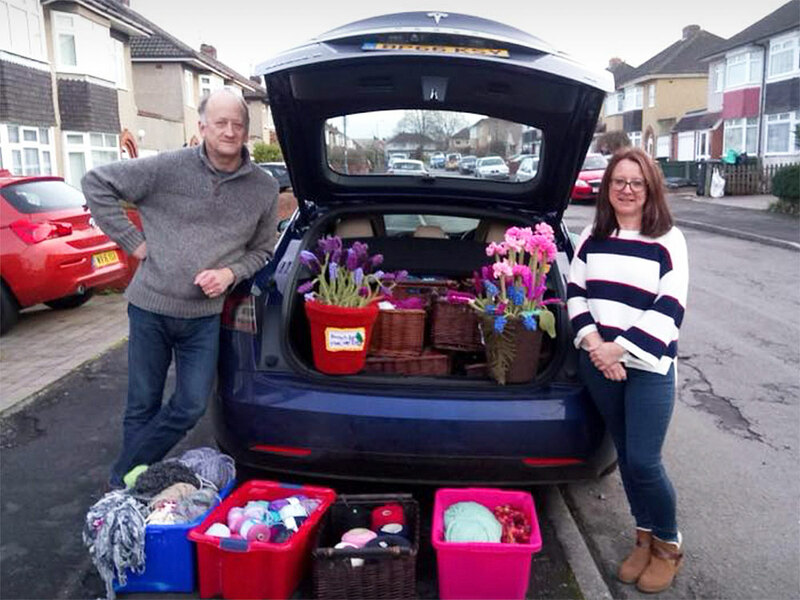 Calculating that such a feat would require a sizeable quantity of wool, I immediately made contact with the charity, and within days, Clare and helper (another Claire) were eagerly and excitedly loading-up their car with Jane’s huge wool stash. 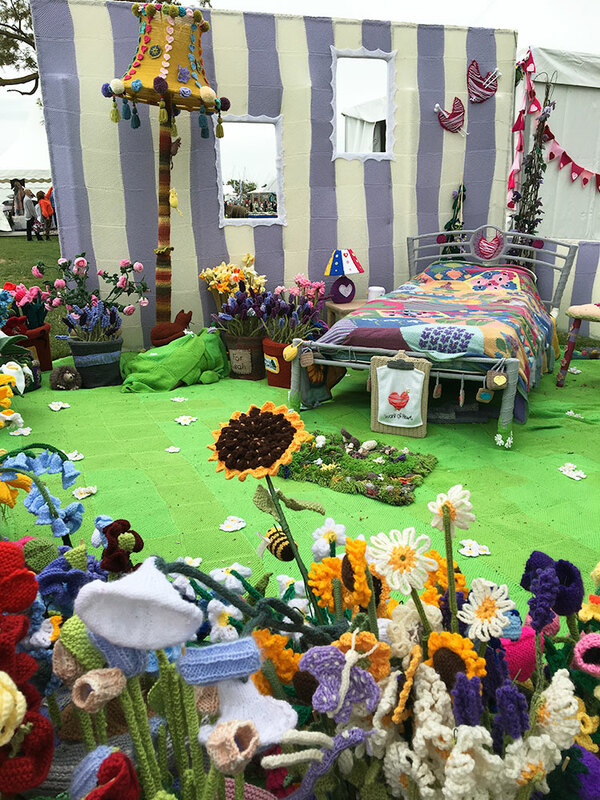 What I was not expecting in return for this, was Clare’s very kind offer to knit a large potted sunflower (Jane’s favourite flower) in Her memory, to be installed within the final knitted garden which was to go on show to the public at the RHS Malvern Spring Festival in May. The use of Jane’s wools was a great way for Jane to contribute to such an amazing project, through the donation of her wools. The more I found out about Clare’s project, the more I wanted to become involved in some way, but how? Clare would not certainly not appreciate my attempts to knit something, but one thing I could do was print! All of Clare’s potted knitted creations all had a name knitted onto the pot. My suggestion to instead create a large label with a letterpress-printed personal message to tie to the stem of Jane's Sunflower , was accepted. So, out came a selection of wood type, some 18pt Caslon, some 18pt arabesque border pieces, gold ink and some favourite off-white recycled card. As well as print a personal message to Jane on one side of the label, I also wanted to print a paragraph as an explanation and appreciation of Clare’s tribute to Jane as part of her own tribute to Ken. Printed, folded, cut and ready for the big day! Fast-forward to the 12th May, and an emotional meet-up again with Clare who led me straight to Jane’s beautiful potted sunflower complete with its label amidst an amazing finished knitted garden. What I don’t believe Clare expected, was for the news of her creation to rapidly spread the globe via social, television, radio and printed media coverage in the run-up to the Malvern show. The number of visitors to the garden were at times overwhelming, and I am happy to say that Clare is already over £15,000 toward her £50k for Ken target! This has without doubt been the most emotional and meaningful piece of letterpress printing I have created to date! Jane's amazing Sunflower complete with visiting bees and a robin. Over the last two years, I have been working through a book design course with the Open College for the Arts, culminating in a final book project putting all things learnt so far, into practice. I decided early-on that this book would be handmade, but be loose enough not to aim to be fine press. 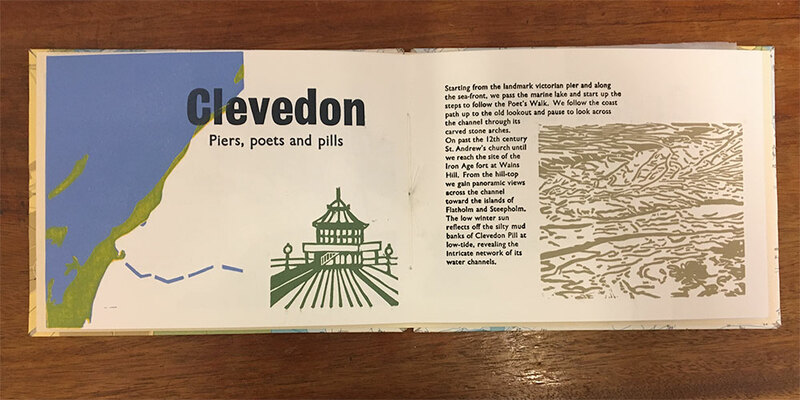 I have always been inspired by the work of Rena Gardiner who using litho techniques and letterpress, worked tirelessly to create huge numbers of guidebooks for the National Trust during the 1970's and 1980's. I therefore decided to emulate her style (using linocut imagery instead of litho) in a book entitled 'My Coast' that takes its reader along a stretch of the local (to me) Bristol Channel from Aust Ferry to Burnham on Sea. I was also very inspired by the Artists Book 'Flatholm' designed and created by ottoGraphic using the poetry of Chris Scully, which was launched at the Bristol Artists Book Event (BABE) back in 2015, at the Arnolfini Contemporary Arts Centre. The simplicity of the vivid screen-printed graphics accompanying the text, really made this work stand-out. Much of the research activity for this book would be made up of visits to the locations featured within, which in itself greatly influences the content. When visiting the victorian coastal town of Clevedon, I was expecting the focus of the journey to be the famous restored pier. I certainly wasn't expecting to be instead, more inspired by the views down the Bristol Channel from Wain's Hill overlooking the mudflats of Clevedon Pill at low tide! Research of other locations revealed some interesting little-known stories, for example the legend of Gunner Haines, who in 1900, after being put on charge for late return to barracks, turned his firearm to the fort's large store of ammunition and blew himself, and a large part of the fort, sky-high. As the book led me onward past Berrow Sands to Burnham on Sea, a story of heroism during a violent storm in the channel during 1897, came to light. Ten crew-members of the stricken SS Nornen, and the ships dog, are plucked to safety by the Burnham on Sea lifeboat crew, just as it runs aground on Burnham Sands. What is left of the skeletal remains of the SS Nornen still appears daily on the low tide. 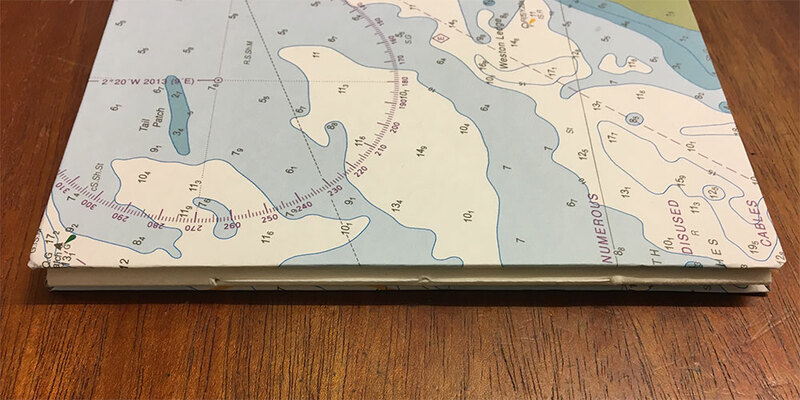 For the construction of the book itself, I decide to opt for an exposed simple-stitch binding with the end-papers attached to to hardcovers, made of grey board coated with admiralty charts reflecting both the actual location and subject matter. I decided to omit any titling on the book covers to maximise the visibility of the beautiful admiralty chart covers, which adequately portray the theme of the book on their own. Final page, and end-paper glued to the back hard cover. So with this book now completed (with some of the ink yet to dry completely! ), and submitted, its time to take a quick breather and focus on something new. In a previous post, describing the bringing together of perspex drypoint prints together with letterpress text to create a booklet of the Peto Gardens at Iford, I expressed the frustration of resorting to the scanning of the drypoint prints and printing onto the book pages with an inkjet printer (on account of the very small number of reasonable prints available from each plate), when I would have far-preferred to use original prints instead. It was at that point, I decided to give etching some serious thought for any future books, as this process would permit me to create a much greater run of prints off of one copper or zinc plate. I also knew that it was high-time I paid another visit to the Peto Gardens in order to study its Italianate structures and artefacts in much greater detail. I made a return visit to Iford and the Peto Gardens during a very hot June afternoon, on the search for some fresh inspiration for a new project. The largest and most-ornate building within the gardens is the Cloisters built by Peto in 1914, and it was one of the carved stone lions guarding this building, that I later chose as the subject matter for a new hardground etching. Despite recently taking a course in etching that introduced me to the process of aquatint to create different degrees of tone on the plate, I instead decided to stick with a crosshatch-shading approach instead, to give the work more of an Italian Renaissance-feel. After several evenings with the etching needle, I decided that it was time to pay a visit to SpikePrint studio to etch the plate in their ferric chloride tank, clean the plate and take a quick proof. Plate just prior to etching. With a successful proof taken it was back home to create a small edition on the Rollaco press. I also wanted to incorporate a print with a passage of suitable letterpress text on the same sheet of paper (Somerset 250gsm buff), to see how image and text would look within a future book. The reveal (I always love this bit)! As the image plate measured 200 x 150mm overall, I opted to compose a passage of text in 18pt Caslon Roman type, with a generous 6pt leading applied to provide an uncluttered and easy-to-read look. Although the alignment of plate and text on the test page was far from perfect, it has certainly provided plenty of encouragement to take these two processes forward for a future book. As one printmaking project ends and I find myself looking for inspiration for the next, I become increasingly aware that experiences, learning and interests of past years are starting to be actively retrieved from the dusty archives of my memory. From my A-level years and through my B.Sc degree at Plymouth that followed, there was a common thread on the theme of Earth Science that ran through my further education. Art unfortunately started to recede in importance after my A level years, but I cannot say it left entirely. Thinking back I am convinced that it manifested itself as an invisible driver of enthusiasm toward my more scientific studies, be that observing plant cells under a microscope, studying various vegetation types upon the wet and windswept hills of Dartmoor, gathering data on top of glaciers in the Swiss alps, and even the presentation of findings visually via charts, maps and even old computer-generated printouts. Although it was always exciting to learn and understand how various natural processes operated, be they botanical or geological, the visual impact and composition of the subject matter being studied was key to my thirst for learning, even though I may have been blissfully unaware of it at the time. As I now spend more of my free-time taking myself on local countryside walks, I will often see something visually fascinating, perhaps worthy of a new sketch or print, which will then trigger a visual investigation which into why the object of study displays the features it does, and what the function of that feature is. This investigation may then literally zoom-in to a microscopic-level where references to beautifully stained microscopic slides reveal the functional building-blocks of the subject matter under observation. I am lucky that the small Leap Valley conservation area, behind my house has a rich variety of habitats, and therefore has great potential as an outdoor 'artistic lab' for some future projects in the new year. But now, I must get that old microscope out of the loft. During the closing weeks of 2015 during some idle web-browsing, I stumbled across an 1867 Albion hand press for sale, made by the well-known London press manufacturer Harrild and Sons. The press was located just over 200 miles away in Fleetwood, Lancashire and had been under the ownership of long-standing family-owned company Ashton Printers since 1877. After a long working life that included the printing posters advertising the procession to celebrate the opening of the Fleetwood Dock, the press was finally retired in 1990, restored, and proudly put on display in the company's back office. I was after a press with a reasonable bed size for printing letterpress books and linocut images, and with its demy-folio bed size (18 inch by 12 inch), this press fitted the bill perfectly, and judging by the photographs seemed to be very well looked-after too. After contacting Ashton Printers and agreeing a price, the next task was to get it dismantled and transported down to Bristol. Enter Albion expert and all-round nice bloke, Giles Hovendon of JMR press, based north of Fleetwood at Kendal in the Lake District. Giles and the press arrived at the studio in January, on what appeared to be a week-long whistle-stop tour of southern England delivering and fixing assorted presses. Following a couple of hours work carefully re-assembling and setting-up the press, the first successful test print was taken. Assembly is complete and the test forme is locked onto the press bed. All that was required now was for the tympan frame to be dressed and the frisket to be attached. Eventually, during late April, after much reading-up and purchasing some buckram bookcloth and bookbinders glue, I made a first attempt at dressing the tympan. The outer tympan first - a bit of a messy first attempt! This was a bit of a messy and untidy undertaking to start with, but once I have worked-out a technique for keeping the dampened backcloth taut whilst applying the glue and tucking the edge strips under the tympan frame, things neatened-up a bit, with the inner tympan frame looking a lot neater than the outer one, which I had attempted first. The inner tympan next - a bit tidier this time! 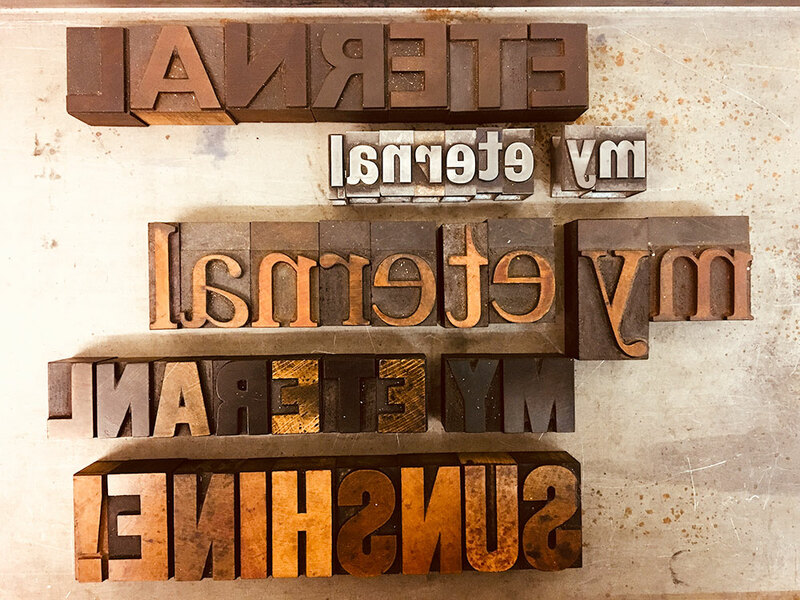 Once the tympan was fitted back onto the press bed hinges and packed with layers of card and newspaper sheets, a number of test prints were taken and more newspaper added until the pull and pressure were just right. Finally the frisket was attached to one end of the dressed tympan and lengths of elastic braid were cut to length, fitted to the frisket frame and stapled together. The last step is very important as the taut braids ensure that the printed sheets are lifted clear of the type or image plate as the tympan, holding the printed paper is lifted from the press bed. The Albion press was once again ready for creating new work. My most recent printmaking and letterpress Blog posts are right here, however if you want to browse my older posts, they can still be found here on my old Blog site. Originally posted on 24th October 2015. As I enthused in my last blog post, I had discovered the intaglio illustration process of etching and drypoint, aided by a five-evening introductory course at the SpikePrint open studio at Bristol Harbourside. Whereas I have enjoyed trying my hand at the popular linocut and woodcut relief processes, neither really came naturally to me. Etching and drypoint processes allowed me to easily scribe detailed imagery onto a plate, and then created moody shading effects by selectively rubbing the Ink off the plate prior to printing on an etching press. The process of drypoint, in particular appealed to me, with its velvety etching lines and the fact that, unlike etching, no nasty chemicals or plate preparation are required. 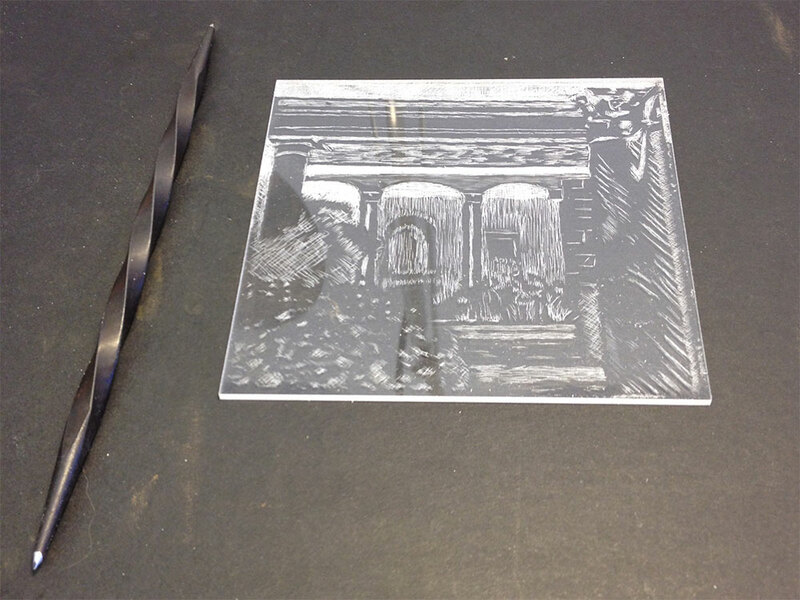 Drypoint can easily be created even on Perspex sheets as well as zinc or copper plate. So armed with this new technique, I was keen to employ this process when creating a book, but then the issues started! Letterpress, along with natural partner relief printing techniques such as linocut, woodcut and wood engraving, facilitate easy repetition of the printed work, expecially in the hands of an experienced printer armed with an Arab or similar treadle press. Intaglio processes however, by their very nature are very different, each individual print requiring the time-consuming careful rubbing of the image plate and the dampening of individual paper sheets before the two are united in the etching press. Even using my basic galley press, I can create up to 30 single colour letterpress prints in one hour, but just four good intaglio prints in the same amount of time. Another issue to contend with, relating specifically to the creation of drypoint prints, is the fact that the useful life of each plate is very short, especially if Perspex sheets are used. This is due to the fact that the characteristic burr, thrown-up by the etching needle, holds much of the ink that makes up the print. This burr is fragile, and after as little as three passes (using Perspex) through the etching press under high pressure, breaks-down, and the image quality noticeably degrades. The use of more resilient copper plate improves matters but only slightly, permitting around ten prints to be taken before breaking-down. In the end, I decided to add the drypoint images into my latest book ‘A Little Boke of Iford’ by resorting to scanning and inkjet printing the original drypoint prints, and using letterpress for the rest. Whereas this overcame this problem, I could not help but feel that the value and magic of creating a handmade book, had now become somewhat compromised by an unwelcome modern-day printing process, more associated with day-to-day quick prints of documents and family snapshots, than something as special as a handmade book. Despite having now printed a small book that I am generally pleased with, I feel that my next project to include intaglio content, must include original original prints instead, despite the increased time and effort involved (even for a very small edition), either by using drypoint or acid etch processes. After all, had time to create a book been an issue at all (which it is not), then even letterpress would have been the wrong solution, and the whole lot could have been churned out on a laser printer in seconds, a brief but totally soul-less activity! Originally posted on 5th August 2015. Right, I’ve just managed to locate my WordPress password and log back onto my much-neglected blog site after an absence of just over one year. Quite a lot has happened over the last 12 months, not least my continuing to explore my intaglio printmaking side following an excellent short drypoint and etching course run by Jo Hounsome at Bristol’s SpikePrint studio early last year. These mediums have allowed me to create prints inspired by great printmakers such as Janes McNeill Whistler and Ernest David Roth who recorded the beautiful architecture of Venice in etchings during the late 19th and early 20th centuries. The last 12 months has also seen the start of my involvement in BSpoke16, a local Art Fair held just north of Bristol, set up by local printmaker Kathryn Williams. These fairs, as well as giving the obvious benefit of selling my work, are a great opportunity to meet up with other sellers and gain a valuable insite into what items of my work, clicks with buyers. Also, in recent weeks, I have been concentrating on my second book, made up of letterpress type (Bodoni of course!) and printed scans of my early drypoint prints. A small Boke of Iford, is my own small tribute to Harold A. Peto, who in the early 20th century, created an Italianate Garden masterpiece in the grounds of the newly acquired Iford Manor, near Bradford-on-Avon, Wiltshire. Recently, I managed to unearth a collection of photographs taken at the Peto Gardens, during a visit ten years before. I have always wanted to created something inspired by this visit, and my engagement with the process of drypoint has given me the opportunity to do this in a book. I am hoping to complete this project in the coming couple of months, so will provide an update as soon as all pages and covers are printed and bound.